I used to work with a guy whose name I couldn’t pronounce. For months, I managed to avoid calling him by his first name until one day I was in a teleconference call and someone suggested that I introduce everyone. So around I went, introducing each one of them until I reached “Paraic” and I was like “uhm, how do you pronounce your name again?” Turns out it was an Irish name and pronounced something like “Pho-rac” (to date, I’m still not 100% sure). I told my other officemate about it and he said he also didn’t know how to pronounce his name. In fact, for months he used to refer to Paraic as “the finance guy”. The other name I can never get my head around is the guy from River Cottage. As much as I love that show, I always call him “Hugh something-something”. This evening I tested my husband (who claims he is also a massive fan of the show). “What’s the name of the guy from River Cottage?” I asked him. “No, just tell me!” I said. “Hugh Whitley?… or Whitely? … or Fernley?” He guessed. I burst out laughing. Turns out he was just as bad as I was. This is one of those recipes where I am totally unsure of how to pronounce the ingredients. Kataifi? Ajvar? Don’t even ask me to try. All I know is that the combination is delicious! The inspiration was from a dinner I had a few weeks ago at Efendy in Balmain. The Ajvar is a Serbian relish made with roasted capsicums, roasted eggplants and some chili. It’s a delicious accompaniment to the prawns and it’s also amazing with fresh sourdough bread topped with goat’s cheese. The herbs come from my newly planted edible balcony, but more on that another time. Pre-heat the oven to 210c. Mix the orange/mandarin zest and juice with the melted butter and pour over the kataifi pastry. Line a tray with foil and spray with some olive oil. Carefully spread around 2 tablespoons of the pastry on a wooden board and place a prawn on one side of the pastry and roll the pastry over the prawn to cover. Lay the prawn carefully on the lined tray and repeat with the remaining prawns. Place the prawns in the oven and bake for around 15 minutes, turning halfway until the prawns are golden. This looks delicious and I especially like the sound of that ajvar sauce. Roasted capsicums and eggplants together…I am so there! Hey Trissa, dish looks enticing and delicious. Your anecdote on HF-W a funny bonus! 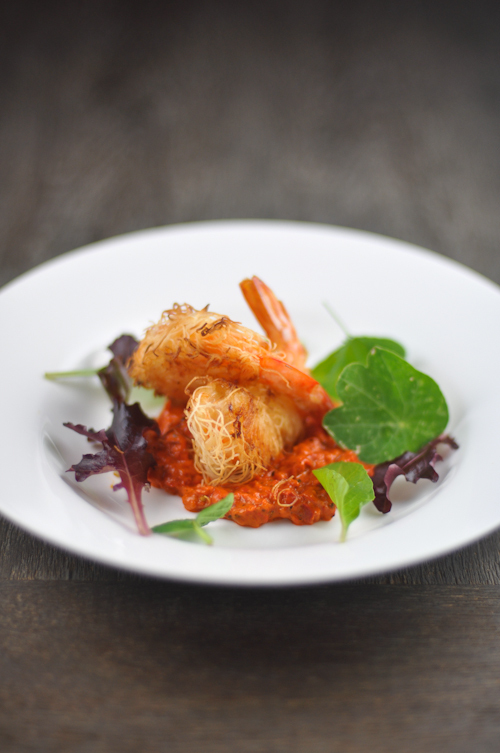 I need to try this prawns. I also have problem with name. I met some gay from my gf work. He introduced hisself and after 2 min I forgot his name. Later he told me once again that is Kozmin! Hi Trissa, this looks delicious Have a pleasant weekend. Trissa! Missed your posts! great to see you back with your funny stories that make me laugh first thing in the morning! 🙂 I love the prawn kataifi. What a beautiful presentation! 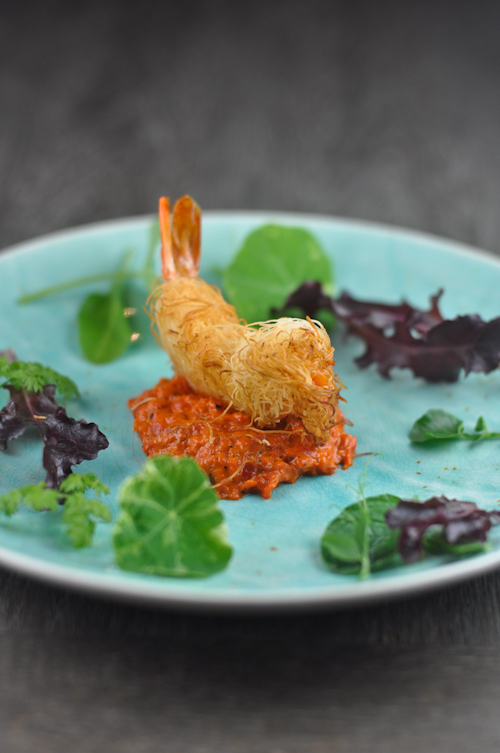 The prawns look so good served with ajvar sauce.